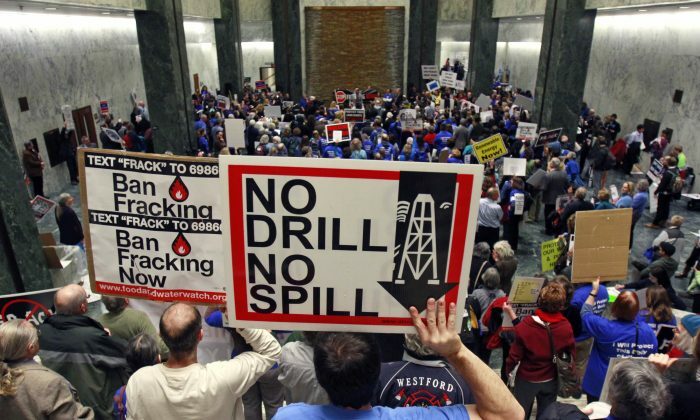 NEW YORK—The city is making its presence known in the battle to keep hydraulic fracturing out of the state. A new bill, expected to be introduced Wednesday, will effectively ban hydraulic fracturing or “fracking” in New York City. Council members Ben Kallos, Helen Rosenthal, and Costa Constantinides are sponsoring the bill to support the local municipalities in upstate New York that have successfully banned fracking in their towns. They hope that other municipalities will be encouraged to amend local laws as well. “We are standing in solidarity with those towns in banning hydrofracking in our municipality in hopes that we can do this across the state and across the nation,” said Council member Kallos in a telephone interview. In June, the state’s highest court affirmed the legality of the bans instituted by the upstate towns of Dryden and Middlefield, setting a precedent that allows more than 170 municipalities in the state of New York to independently ban fracking. The proposed bill announcement follows recent reports that the results of a long-awaited Health Department study on the impact of hydraulic fracturing is expected by year’s end. Gov. Andrew Cuomo is also expected to make a decision on whether or not to lift the state’s moratorium against fracking, in place since 2008. A ban on fracking in New York City sends a strong message, says Kallos. He sees the city as a leader in the state and the nation and believes others are looking here for leadership. Constantinides hopes this ban will help to promote a greener city. “As we continue to combat climate change we must shift our focus from the unsustainable and untested new sources of energy such as hydrofracking and move our city towards more green energy,” he said in an email statement. Kallos believes the city’s stance on fracking will encourage other counties to assert their rights to impose similar bans. A city ban on fracking comes with the power of an 8.4 million population and a city law firm of 500 attorneys, which will give the “gas companies a harder time than they have with some of the other counties and towns and will show that they’ve got some support,” said Kallos. n 2010, former New York state governor David Paterson issued an executive order placing a six-month moratorium on fracking across the state.